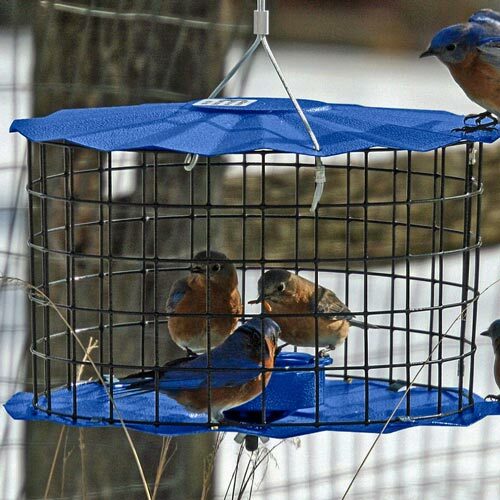 Specially designed to allow bluebirds in to feed at their leisure, the smooth-coated metal grid is too small to let predatory birds invade the space. 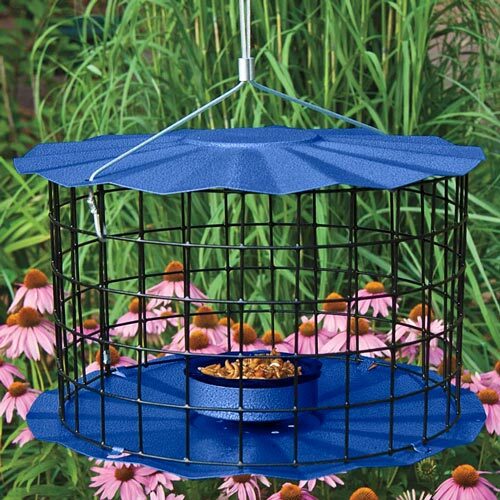 Includes a glass dish to hold mealworms (the bluebird's food of choice) and rust-resistant drainage holes for a cleaner, safer feeding environment. Plastic-coated cable hanger has an adjustable toggle to make hanging a snap. Made of weather-resistant powder-coated steel, it is sturdy enough to last a lifetime with proper care. No assembly required. Made in the USA. H10"xW15"xD15". Metal grid openings are 1 3/8" wide.